Upscale hotel chain Radisson Blu Edwardian, has rolled out TME’s MM7000 Combined Temperature Monitoring System at 12 of its London hotel restaurants. Imagine instantly recording the temperature of everything in your kitchen: fridges, freezers, ovens, food deliveries - even an individual burger or plated meal - all in a flash: no need to write anything down or key in data, just scan a barcode and move on. Add to this, the knowledge you will receive instant alerts to out of temperature events across multiple sites, and you begin to see the potential of TME’s MM7000 Combined Temperature Monitoring System. The MM7000 System offers integrated paperless spot checks AND 24 hours monitoring, pairing handheld barcode scanning thermometers with fixed wireless radio monitors. Results are tracked remotely across a number of sites, with problem temperatures communicated via Bluetooth or radio signal both on-site and off-site via on-screen prompts, audio visual alarms, text and email. of personalised barcodes. Barcodes are universal, free and easy to produce, and can include high/low alarms and onscreen prompts. 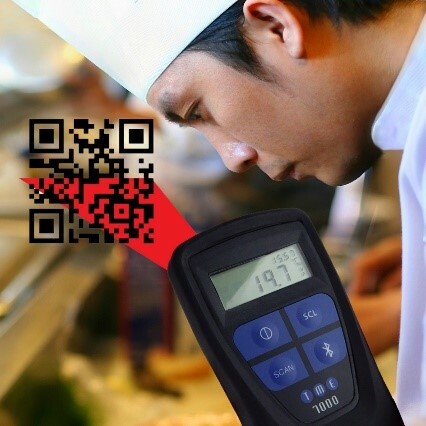 Unlike others, TME’s Bluetooth barcode thermometers also record with or without Wi-Fi connection.